Preheat oven to 450 degrees. Place the lamb in a roasting pan, bone side down and fat pad up and roast for about 20 minutes or until a meat thermometer inserted into the thickest part of the lamb (away from the bone) reads 135 degrees. While the meat is roasting, combine the bread crumbs, shallots, herbs, olive oil, chicken stock and a pinch each of salt and pepper in a small bowl. Preheat the broiler. 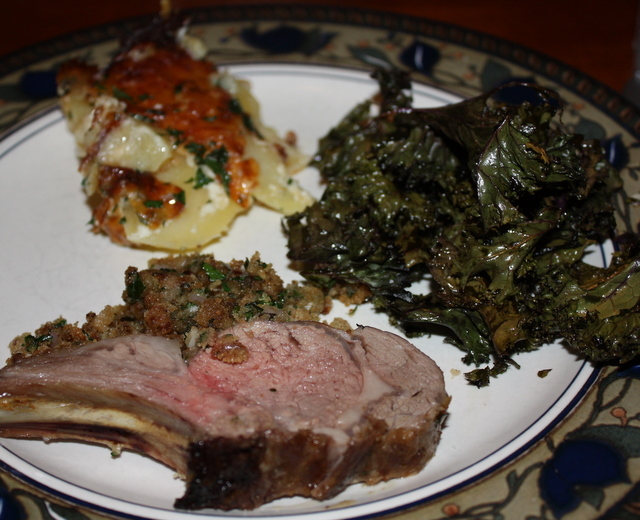 When the lamb is done roasting, spread the bread crumb/herb mixture evenly over the meat side of the lamb rack. Place the lamb under the broiler (about three inches from the heat) and broil until lightly browned (3 minutes?) Be careful that the crumb coating doesn’t burn. Transfer the lamb to a serving platter and cut between the bones to separate it into chops for serving sizes. Serve immediately. * Your butcher will trim the fat off and french the bones for you, if you ask. I left the “fat pad” on to baste the meat as it roasted (then just eat around it when you eat the chops), but that’s personal preference. Feel free to cut it off, too, for a prettier presentation.